Hello, crafty friends! 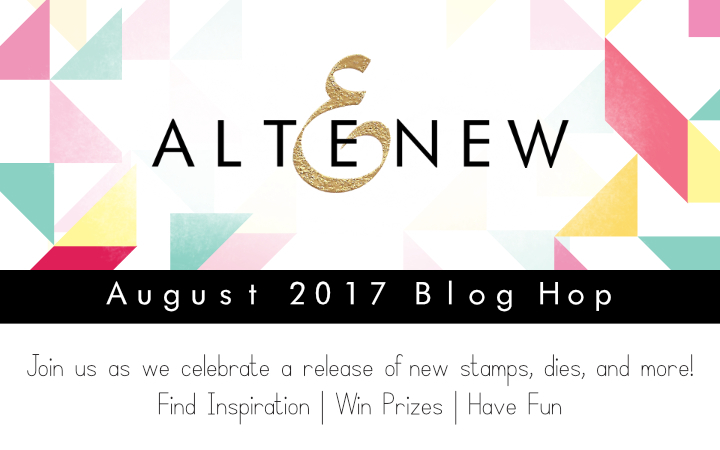 Welcome to the Altenew August 2017 Release Blog Hop Day 2! It's Dana here and I'm so honored to be part of this hop, today. I hope you are from Missy's blog and if not, please head over to Altenew Scrapbook Blog to start. Full blog hop list is in the bottom of this post, too. 1. To celebrate this release, Altenew is giving away a $50 gift certificate to THREE lucky winners! Please leave a comment on the Altenew Scrapbook Blog by Thursday, August 31st at 11:59pm EDT for a chance to win. The winners will be announced on the Altenew Scrapbook Blog on Saturday, September 2nd. 2. I will draw a winner who will receive a $30 gift certificate. I'll announce the winner on my blog on September 1st. 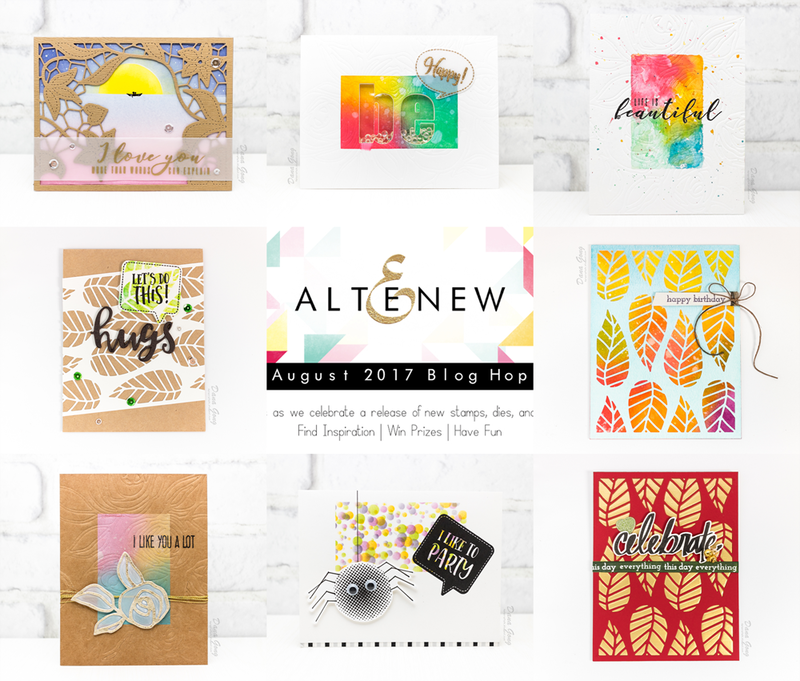 I had so much fun time with Altenew August release, so I have 8 cards to share with you. Let's get started! For the first card, I started by die cutting Altenew Doodled Lace Cover Die from woodgrain card stock. I planned to use this cover die like elegant window of old castle, so I cut some part of it using scissors as shown in the picture. Then, I softly ink blended with distress inks on bristol paper and created romantic night river scene using masking technique. I drew a couple on the boat with Copic multi liner and it's not a secret I completed them after 25 times more trying. Lol. I also added white dots on the sky using white gel pen. Sentiment is from Altenew More Than Words Stamp set. I gold heat embossed it on vellum and placed it on the card front. I foam mounted cover die on the background panel and adhered all of them on A2 sized white card base. In the next cards, I featured Altenew Rose Filament Die Set. Basically, I dry embossed each background with this die set after adding colors in the center using different mediums and techniques. Kraft paper + Distress oxide inks. I used same colors for simple comparison, Worn lipstick, Fossilized amber, Broken china and Cracked pistachio. For this card, I inked all distress inks on the acrylic block and spritzed water and stamped it on the card base. This way is inspired from Jennifer McGuire's video :) I then splattered each colors of distress inks here and there with water brush. After dry embossing the roses, I stamped sentiment from Altenew More Than Words Stamp set. For next card, I roughly ink blended with distress inks using making technique. I usually prefer soft blending though, I love how the result turned out with shaker elements! I spritzed a little bit water over the blended part using mini mister. I die cut 'be' alphabets from Altenew Bold Alphabet Die Set. I then foam mounted front panel on the card base after adding sequins inside. Lastly, I gold heat embossed sentiment from Altenew Speech Bubbles Stamp Set onto vellum and adhered it using clear foam tape as shown in the picture. For my 3rd card with Altenew Rose Filament Die Set, I ink blended with distress oxide inks. It was my first time to use oxide inks on the kraft paper and I love the result! After dry embossing the background, I dry embossed one of flowers on the vellum and fussy cut it out with scissors. Can you see the textures of rose? It's not intended one! I think it came out naturally with thick vellum and embossing pad between cutting pads. I then die cut same rose from metallic paper and adhered it on the vellum rose using glue. I stamped sentiment from Altenew Tea Time Stamp Set to finish off this card. How about stretch your stamps? 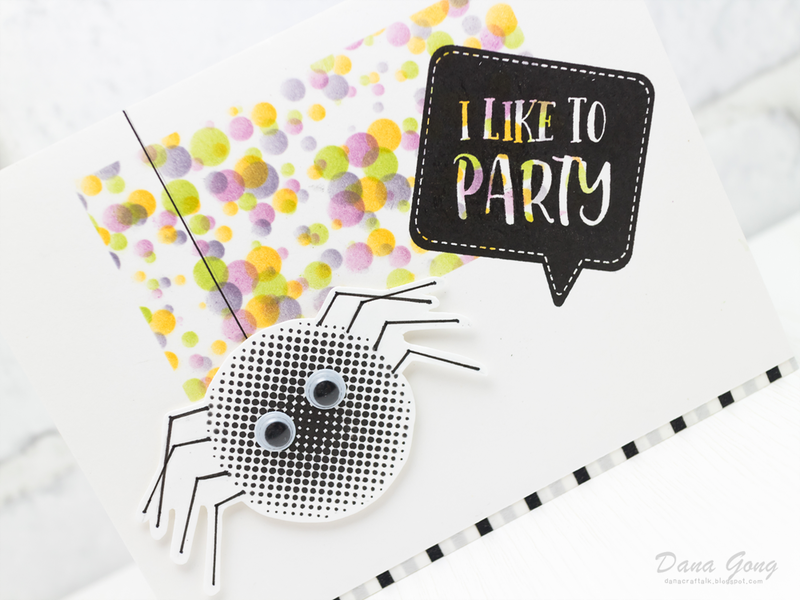 As soon as I saw 'I like to party' sentiment from Altenew Speech Bubble Stamp Set, some fun ideas came to my mind and here is what I came up with. Yes, it's a Halloween theme! I'm big fan of critter stamps, so I often critter-ize something when I don't find critter stamps nearby. 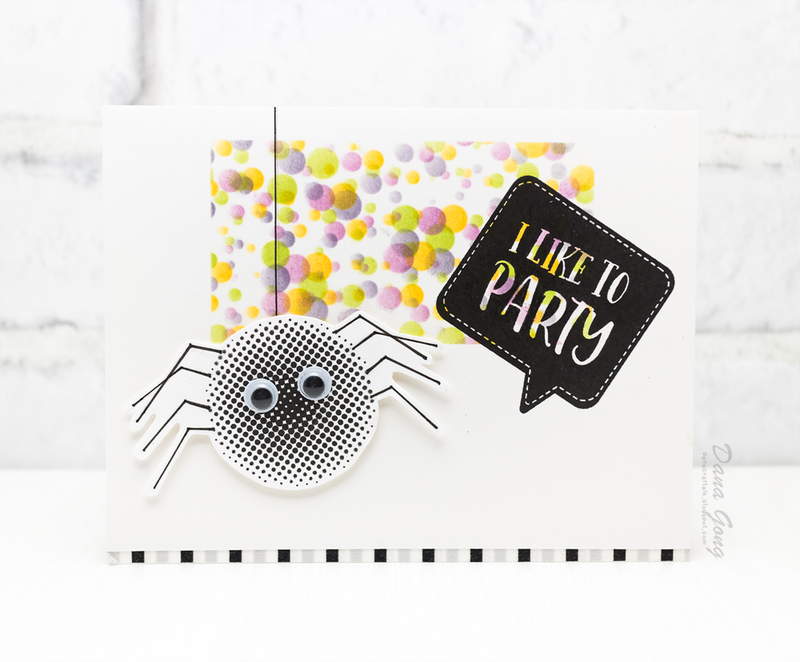 In this time, I created spider from Altenew Halftone Circles Stamp Set. I stamped one of halftone circles with black pigment ink and drew legs using copic multi liner. I then embellished googly eyes to spider. For background, I stenciled with dye inks using Altenew Tiny Bubbles Stencil and masking technique. Then I stamped speech bubble from Altenew Speech Bubbles Stamp Set. I really love the white part of sentiment with colorful background. To finish, I added washi tape on the bottom of A2 sized white card base and mounted all elements where I wanted them using glue and foam adhesive. Now, this is the last collection I prepared for today. I'm totally in love with this Altenew Striped Leaf Cover Die!!! It is so very versatile and I have a ton of ideas to use this die, and I'm sharing 3 of them with you. In these days, I'm in a good mood because my favorite season is coming! In this card, I tried to express the most beautiful moment of fall with fresh blue sky and colorful leaves of trees. I started by ink blending the white card stock with distress inks and made ombre sky colors. I then die cut it using Altenew Striped Leaf Cover Die. For background, I sponged lots of autumn color distress inks on the watercolor paper and spritzed water by fingers. After dried completely, I mounted two panels I created each other with glue. I then stamped sentiment from Altenew Super Script Stamp Set with Versamark ink onto light grey card stock and heat embossed it with amethyst embossing powder. I then trimmed sentiment panel using craft knife and added bamboo ribbon on the right side of it. With foam mounting the sentiment panel, I finished this card off. For next card, I die cut leaves two times using Altenew Striped Leaf Cover Die from watercolor paper and adhered it on the kraft card base with glue. I then cut the extra part using scissors. I used the other die cut as a stencil. 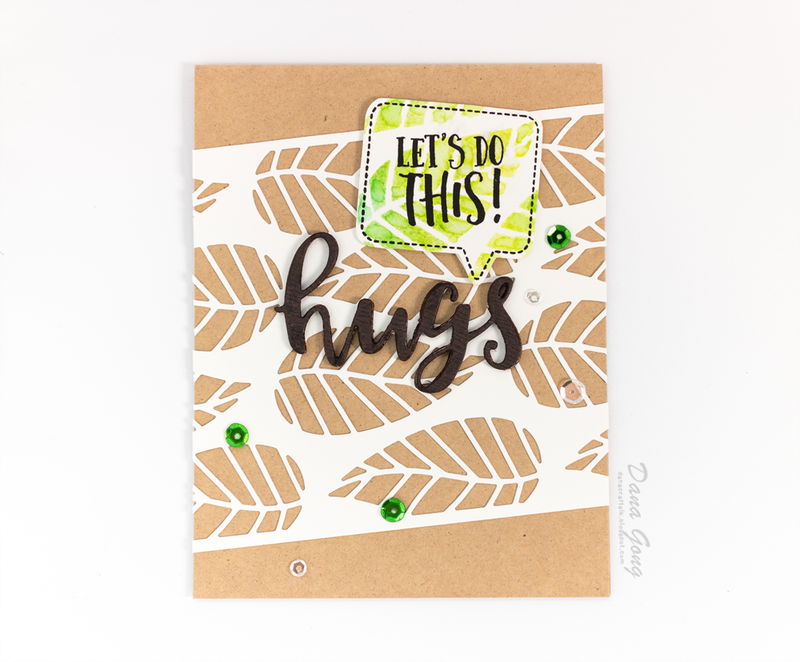 I ink blended with distress inks using this stencil and brushed lightly with water over the stenciled leaves. Then, I stamped sentiment from Altenew Speech Bubbles Stamp Set on it and fussy cut out using scissors. 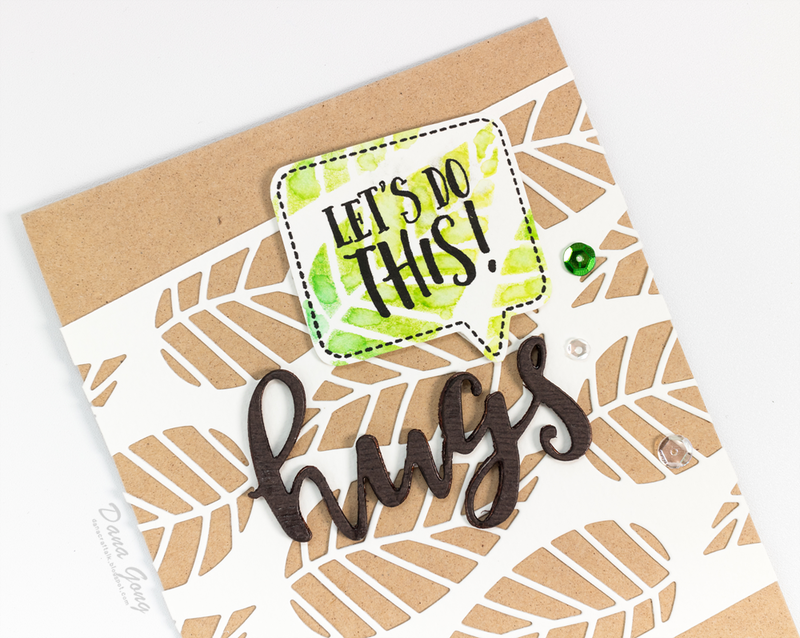 For the center part of this card, I die cut 'hugs' using Altenew Script Words Die Set from woodgrain card stock and craft foam. I glued each other and colored side of them using dark brown copic marker. I glued all pieces as shown in the picture and embellished some sequins here and there to finish this card. Yay for the last card! I have some friends whose birthdays are near Christmas season. I've always prepared two cards, birthday & holiday cards, but It looks like just one card is also good for them if they get Christmas themed birthday card like this. 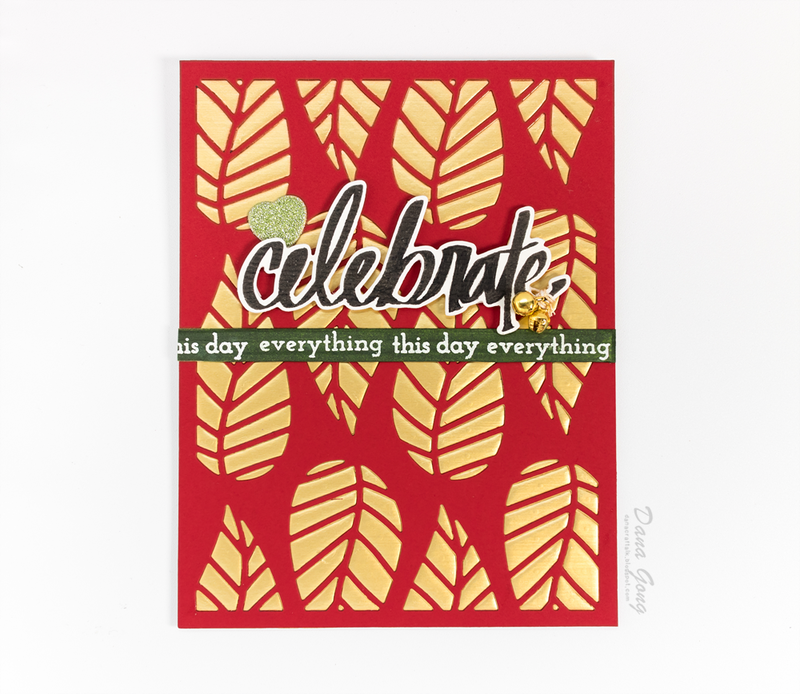 I started off by die cutting the red card stock using Altenew Striped Leaf cover Die. I then dry embossed metallic gold card stock using same die for dimension of leaves. I mounted two panels each other using glue. 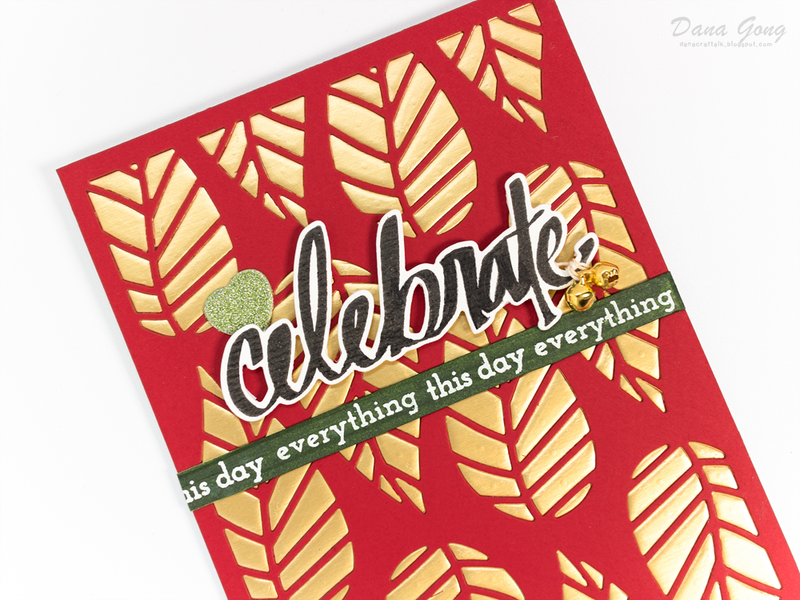 I stamped 'celebrate' sentiment from Altenew Super Script Stamp Set and die cut with coordinating die set. I added mini jingle bells on the sentiment and it is really cute! For other sentiments from same stamp set, I colored Christmas green colors using Altenew Artist Markers Set A on a piece of white card stock. Then, I white heat embossed the sentiment on it. After mounting sentiment and sentiment bar with foam adhesive and glue, I die cut small heart using Altenew Halftone Hearts Nesting Die Set from glittery paper and placed it behind the sentiment. Hope you enjoyed these cards and got some inspirations. Plus, I'm sharing how I used Altenew Storage Pouches (Large, Medium) with my stamps, dies, stencils in my IG with mini video. Click HERE. Your next stop is amazing Enza Gudor! Thank you so much for stopping by and happy hopping! Wow all your cards are fabulous!!! Every single card is amazing! I can't get over that beautiful scene you created behind that awesome background die - but all those cards with impressed roses in them - they are GORGEOUS. Can't get over it. Thanks so much for sharing all this inspiration for this release! WOW! What a great collections of cards, and so many interesting techniques. I couldn't possibly pick a favorite. What a different take on the new products. So well done. lovely cards, I am loving this new release! So many beautiful cards, so much inspiration. So very creative using the Doodled Lace Cover die as a frame. Beautiful cards love the shaker card. Thanks for sharing lovely inspiration. You are so creative!!! I love the way you used the rose dies for embossing texture - and such a lovely idea to combine that with the acyrlic block watercoloring technique. Also really loving the ways you found to use that leaf cover plate die. I can't wait to see more of your ideas! Beautiful cards - thank you for sharing today! I don't even know where to start - all absolutely gorgeous and creative cards. all wonderful, Dana - but the rose filament card is absolutely gorgeous - love it!! Eight cards-wow!! 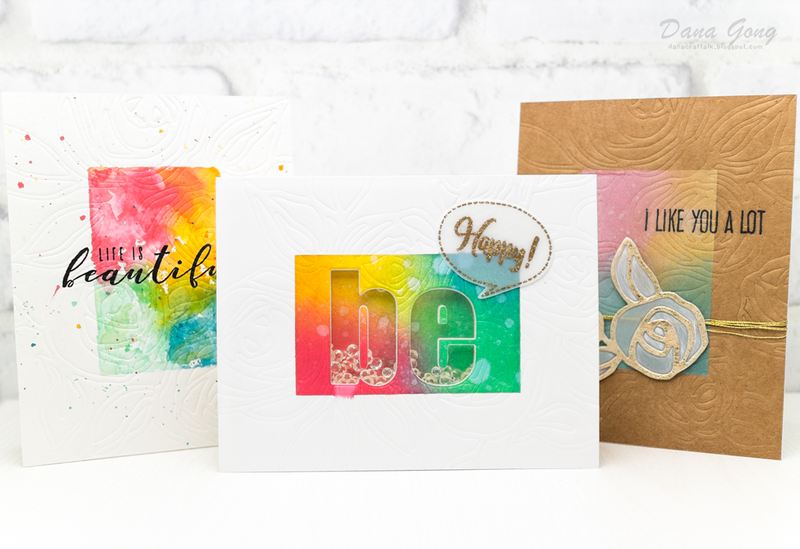 You certainly were inspired by the new release products, and these cards are just fabulous! What lovely cards. They showcase the new release so well. Thanks for sharing them. Great cards! Love the leaves. Eight cards! This is the first I have seen of the Doodle Lace Die - love it. Wow, lovely creations! Thank you for the inspiration. So many wonderful cards! I am especially loving the the masked/dry embossed cards, such a wonderful impact, CAS but gorgeous texture and color. My favorite though is that spider, so fun! Wow--love the cards you created. WOW Dana, you are a MACHINE! These are all simply STUNNING! All are so beautiful, TFS! 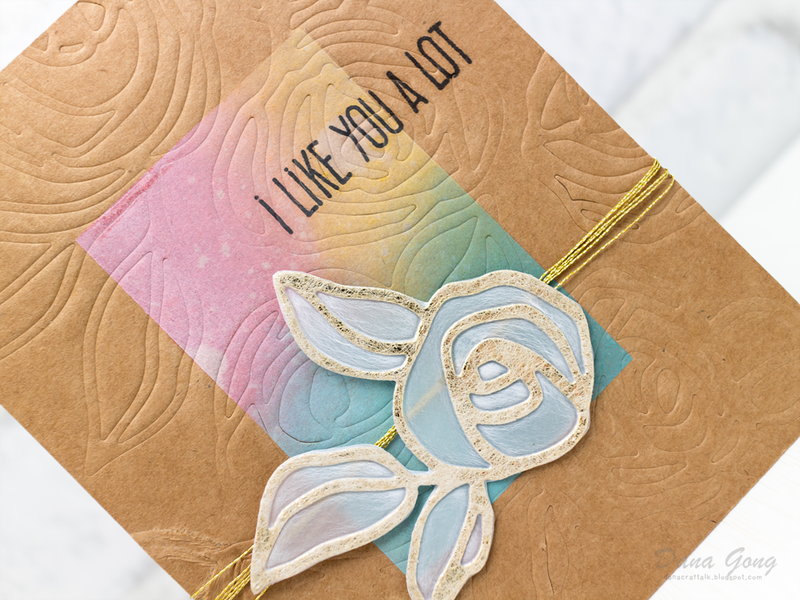 Love how you used the Rose filament die to emboss the background! Wow. Wow. Wow! So many amazing cards, I even can't chose which one I like the most. Bravo!!! OMG!! WOW! So many fabulous creations! All are gorgeous and so creative!! Beautiful cards! All of them! So many beautiful cards! Love how the first one with the couple (25 times?! I wouldn't have the patience! ), and the fun spider is a great idea! Really great card ideas. That spider, too adorable. I had to take a second look :) Altenew does such a good job with planning their items for release. You are so creative, use the products in new ways, great cards! The spider was fun! You really put a lot of work into these cards, Dana! Love each one of them. So creative & beautiful cars ..loved all !! Your beautiful work brilliantly displayed this new release! Awesome! Every single card was my favorite until I scrolled down to the next one and the next one ..... they are all gorgeous, thanks for sharing your incredible talent! 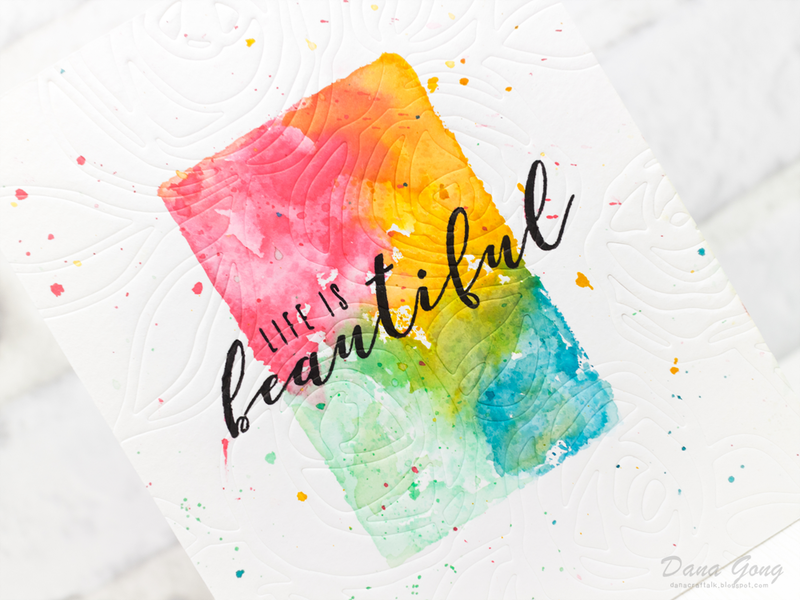 Your life is beautiful card is so stunning. Ty for sharing all this inspiration! So many beautiful cards! I love the layout of your first card. I've never seen anything quite like it, and it makes me think of warm island beaches. Beautiful cards. I love the die embossing technique. What a great variety! Thanks for all the inspiration. eight inspirational cards and each one is better than the other. thanks for showing the different distress ink usage, means a lot for beginners like me. Such fun cards! Gorgeous! And I don't know how you manage to put Worn Lipstick next to Cracked Pistachio and not make a yucky muddy mess! Thanks for sharing. Love the shaker card! It makes me happy!!! Oh my gosh...your samples are gorgeous! Love the unique ways you use the dies. This release is unbelievable! Everything is so pretty! I don't even know where to start as all of your projects are amazing! I love the various techniques you've shown on all of these! Love the life is beautiful cars. The background looks so complicated but sounds so easy! Definitely my kind of background!! Fabulous cards! 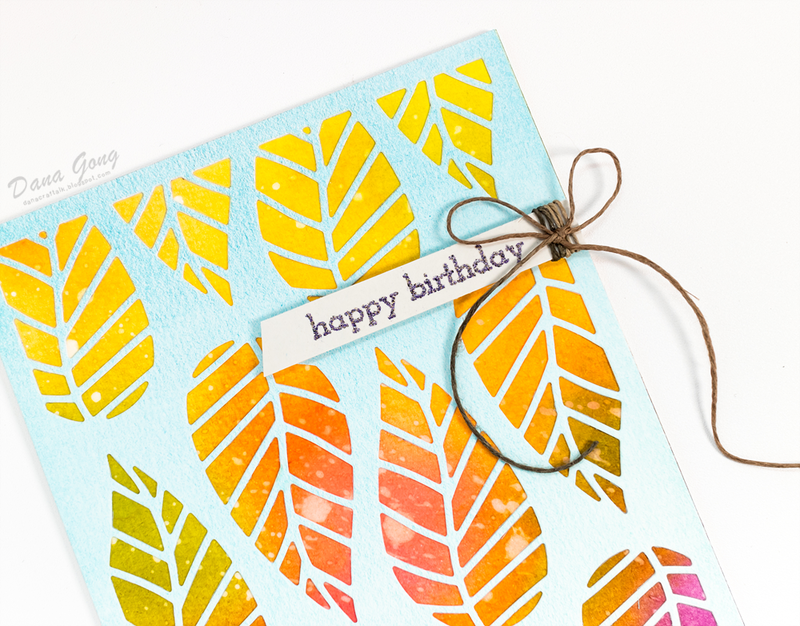 The Striped Leaf Cover Die you show so many pretty ways to use it! And the Doodles Lace card... wow!! Gorgeous! Wow, you created so many wonderful cards. My favorite piece from the new release has been the Striped Leaf but I'm taking a second look at the Doodled Lace. I love how you used it on your first card. I absolutely love all your cards! What great color! Great ideas! Wow, all these cards are AMAZING! I can't believe you doodled the boat in the first card - I was wondering which stamp set that came from! Gorgeous cards! Thanks for all the inspiration. Oh my goodness, your cards are beautiful!! I love the 3 dry embossed/ Distress Ink cards the most. I can't wait to try these. There are so many awesome dies and stamps in this release!! I can't pick a favorite, but I really enjoyed looking at all the different techniques that you used. The leaf die with inlay really catches my imagination. It's unique and yet would be easy to mail. Love all your examples but especially the ones with the dry embossed rose filament die. They are so pretty! All your cards are gorgeous! The one that blew me away is the first one and the ones made with the Striped Leaf cover die. Your cards are just amazing! Such original and lovely designs. Thank you. Gorgeous cards....huge round of applause :-)!! So many wonderful cards but that scene one is so gorgeous. Wow! What a fabulous array of inspiration! Love all the amazing cards. And I am totally in love with this release! 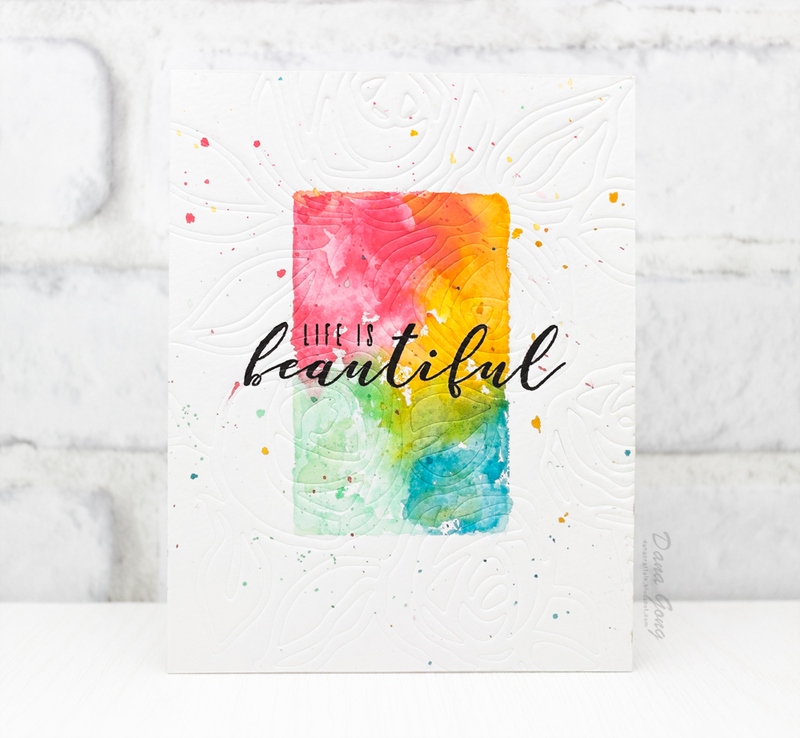 Love your cards - so many pretties. I am amazed with your talent. WOW!!! Wow, you really went all out. Beautiful cards! I love the dry embossing you did with the rose filaments die set. Same technique but 3 very different cards. And same with the striped leaf cover die - 3 beautiful yet very different cards. I love how just changing a colour or a colour medium can give a totally different look. Your creativity with the halftone circle is just fabulous and inspires me to be creative and think outside the box. 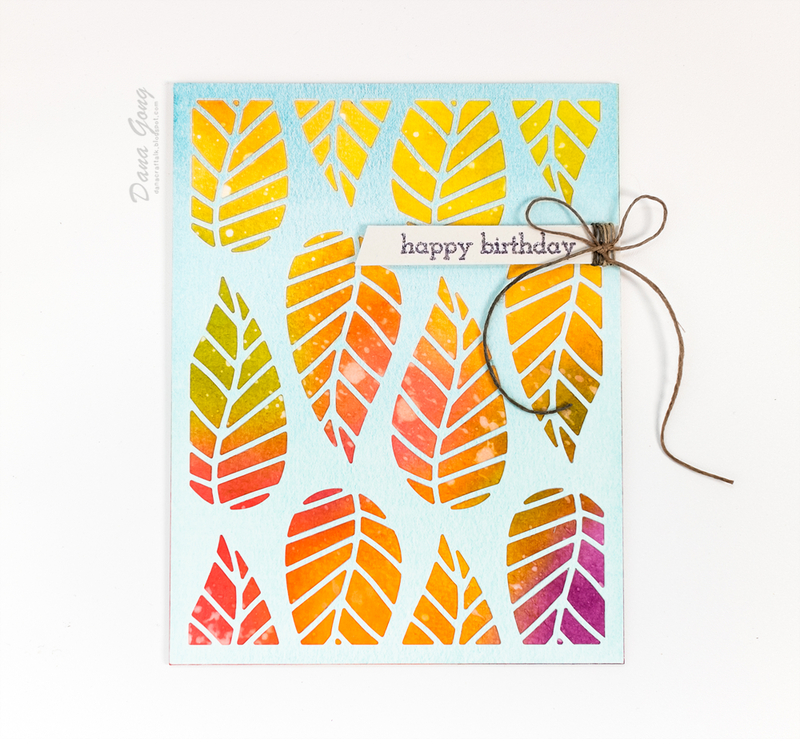 Dana, I love your creative uses of the striped leaf cover die! Mine is supposed to arrive tomorrow and I can't wait to make some beautiful cards with it. I have a question about the red and gold card you made. You said you dry embossed the gold part using the leaf die. Exactly how did you do that? 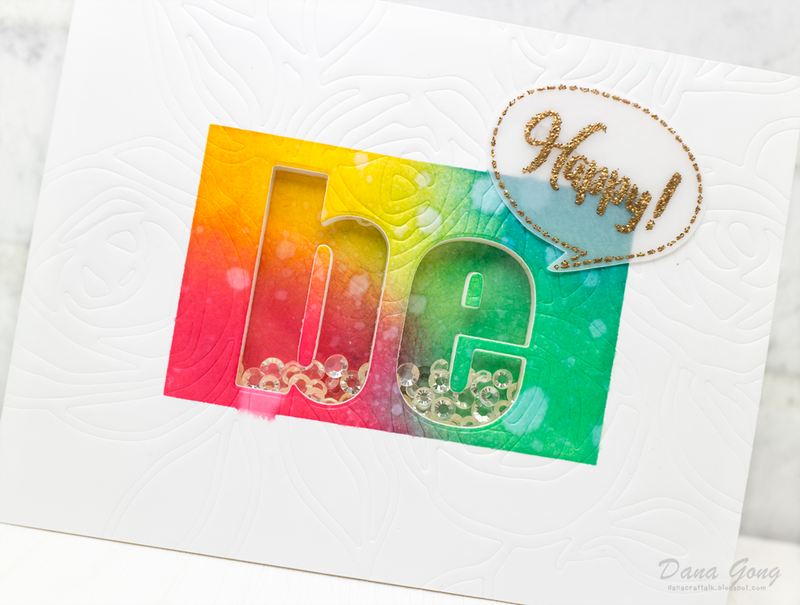 I have a Big Shot and am familiar with lots of embossing ideas except that one. Can you tell me the "sandwich" you used to achieve that look? Hi! It's very easy! For dry embossing, you need one embossing pad (I used Crafter's Embossing Pads from Cherry Lynn Designs) or craft foam. Then, stack following elements up on the Tab 1 of big shot from bottom to top : cutting pad, embossing pad, paper, leaf cover die and another cutting pad.